An anti-crime group has questioned before the Supreme Court (SC) the alleged special accomodation being accorded to Senator Leila De Lima who is under police detention for her alleged involvement in the illegal drug trade inside the New Bilibid Prison. In a letter dated March 6 addressed to Chief Justice Maria Lourdes Sereno, Volunteers Against Crime and Corruption (VACC) founding chairman Dante Jimenez lamented the "extremely unfair special treatment being enjoyed presently" by De Lima at the Philippine National Police Custodial Center in Camp Crame. De Lima's co-accused, former Bureau of Corrections officer-in-charge Rafael Ragos is detained at the National Bureau of Investigation headquarters while the senator's former driver-bodyguard Ronnie Dayan is detained at the Muntinlupa City Jail. 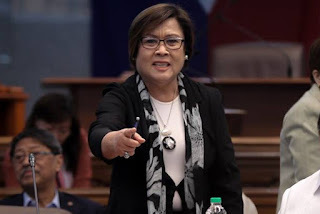 Jimenez said there was no legal basis to detain De Lima and other "wealthy and influential" personalities in a facility not under the supervision of the Bureau of Jail Management and Penology (BJMP). "In our humble research and inquiries from experts in the field of law, we find no concrete basis under existing laws or procedure to sustain or validate such an apparently undue classification. It can be no less than special treatment," the VACC leader said. Jimenez cited the equal protection clause in the Constitution and Section 63 of Republic Act 6975 which states that a person awaiting investigation or trial should be under the custody of the district, city or municipal jail. These facilities are under the supervision of the BJMP. "Indeed, it is both forlorn and perplexing that, while there is an existing law on the matter, we shy away from implementing the same, worse, within this august judiciary and at the expense of those who have 'less in life,' who, we profess, are supposed to have 'more in law,'" said Jimenez, whose group led the filing of drug trading cases against De Lima and other personalities. "It is equally perplexing that this should be the case when we have always and consistently held that when the law is clear, it should be applied outright," he added. Jimenez urged the high court to address the issue "at the soonest possible time" by ordering all courts and judges nationwide to implement Section 63 of the RA 6975 "absolutely across the board, without fear or favor."